Viewer confidence in the site’s content is also increased when state who your program is associated or partnered with. Include associations or use the logos (with permission) of well known groups such as the American Association of Pediatrics on your site. Also consider prominently stating the purpose of your website so that readers can quickly assess the site’s content and determine whether or not it pertains to them. Describes “1-3-6” and states the purpose of their website. 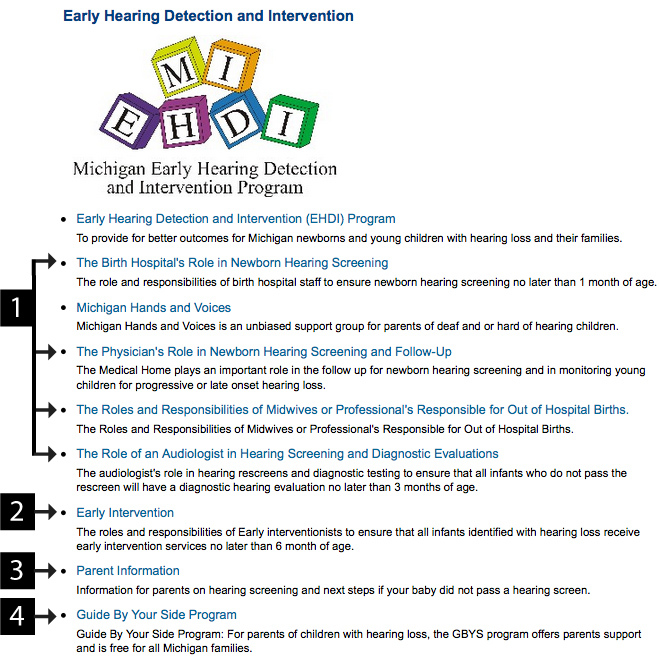 Remember 1-3-6: Hearing screening test for all babies by 1 month of age, diagnostic evaluation by an audiologist no later than3 months of age if baby did not pass hearing screening test, early intervention by6 months of age if baby is diagnosed with a hearing loss. The website lists each section for the appropriate stakeholder and provides a brief description of what is included. Link to PA EHDI Program Contact. Provides contact information and phone numbers. The contact page also contains a form to request more information or to make comments. Uses American Association of Pediatrics, Pennsylvania Chapter logo and states that they are funded by the Pennsylvania Dept. of Health. EHDI websites are important for a wide array of users–physicians, audiologists, families, and early interventionists. Content should be written and formatted for the specific target audience. Content geared towards professionals can be more technically oriented, while content for families should be written for people with basic literacy skills. If possible, content should be provided in multiple languages to ensure that families whose first language is not English can also benefit from the information. Review demographics in your state to determine which languages are appropriate to include on your site. Information about EI resources for children who are Deaf/hard of hearing: Family organizations, resource guides to help families learn about communication options, etc. Louisiana's EHDI website provides information for each of its stakeholders and each section is organized in a similar fashion. The page offers a description about the stakeholder's role in the Louisiana EHDI process. After clicking in the Español link in the top right corner of the "families" page, the majority of the website pages are translated into Spanish. Going back to the home page returns to the English version webpages. 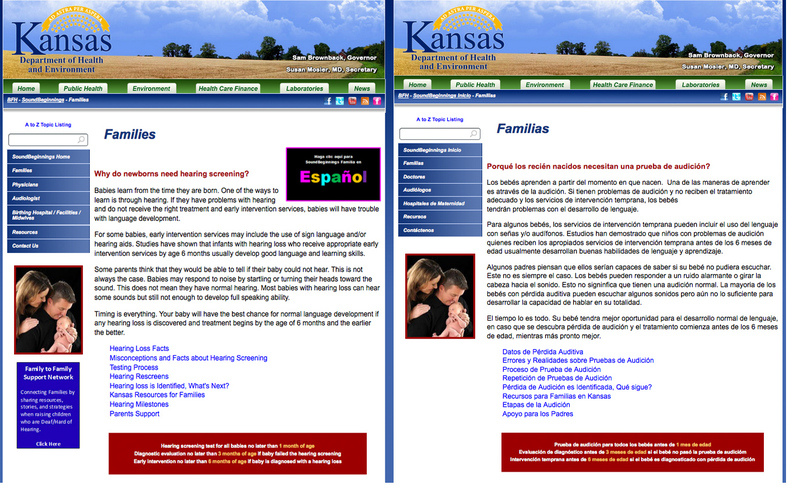 Kansas provides a resource guide in Spanish as well. Virginia's EHDI website provides two pages for families: one in English (Information for Families) and one in Spanish (Informacion para los Padres). Both pages provide resources such as videos, posters, and PDFs in the appropriate language. Screening, diagnosis, intervention, family support, and surveillance information are vital components of the EHDI process. Content needs be written in clear, simple language because all stakeholders are considered part of the target audience. Essential information should be provided to answer “who, what, where, when, and why” questions. To ensure appropriate screening, follow-up and referral processes Wyoming created an EHDI Database web application. 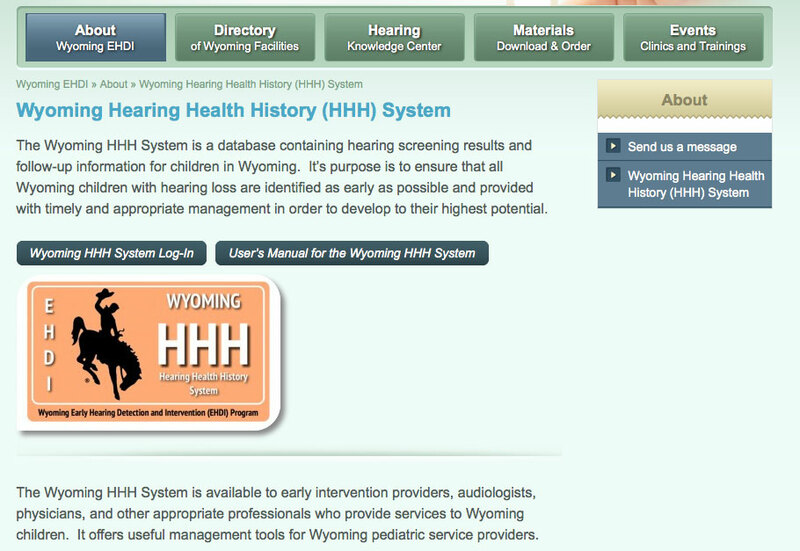 The Wyoming HHH System is a database is used to record hearing screening results and follow-up information for children in Wyoming that is available to the appropriate providers. 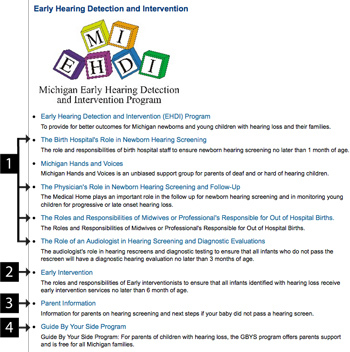 Michigan EHDI process (Figure 1.3b) is presented on the following pages. Provider Roles for Newborn Hearing Screening & Diagnostic Evaluations: Describes information needed for Hospitals, Physicians, and Midwives who conduct hearing screenings and for Audiologist who also do Diagnostic Evaluations. 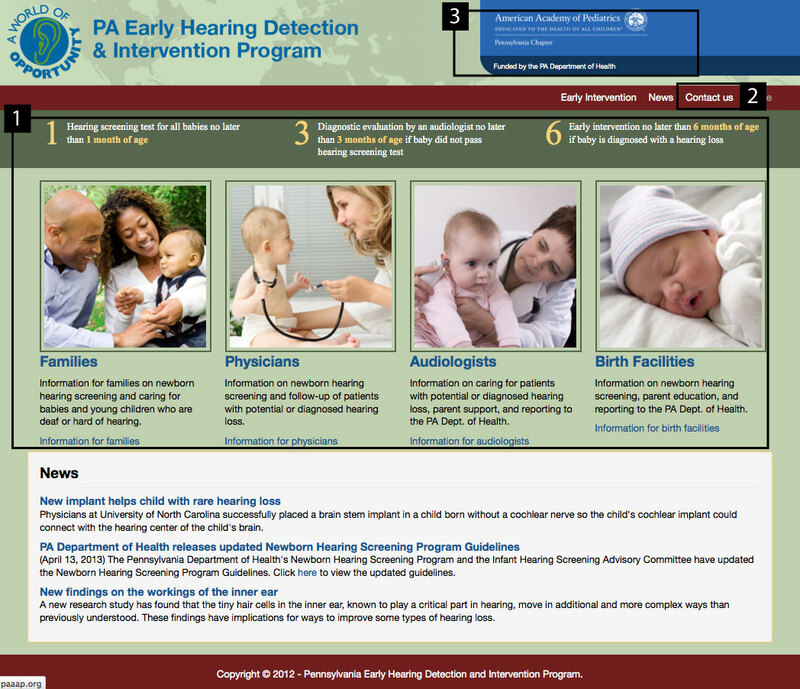 Early intervention: Provides contact information and links related to early intervention. 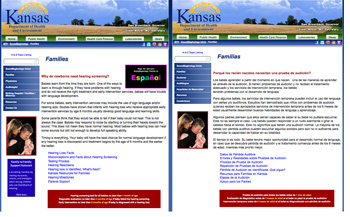 Parent Information: Provides information on the types of test and what families can do. List of facilities that preform screening and/or diagnostic hearing test. Guide by Your Side: Is a support program for families who have infants or young children who are deaf or hard of hearing. Each page contains links to brochures for stakeholders, reporting information and forms for providers, and other information and resources. 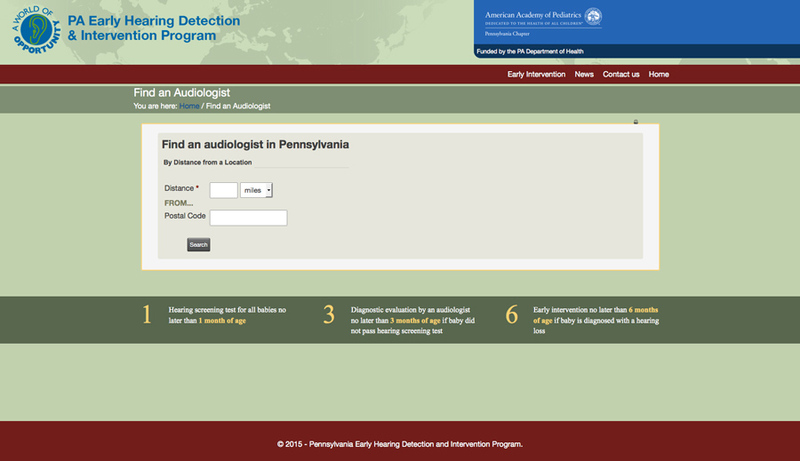 It is important to keep up-to-date information for health care providers, audiologists, and interventionist. Some EHDI sites have PDFs that list their facilities which provide these services while other sites either use the EHDI Pals or have created an interactive application to search for providers. 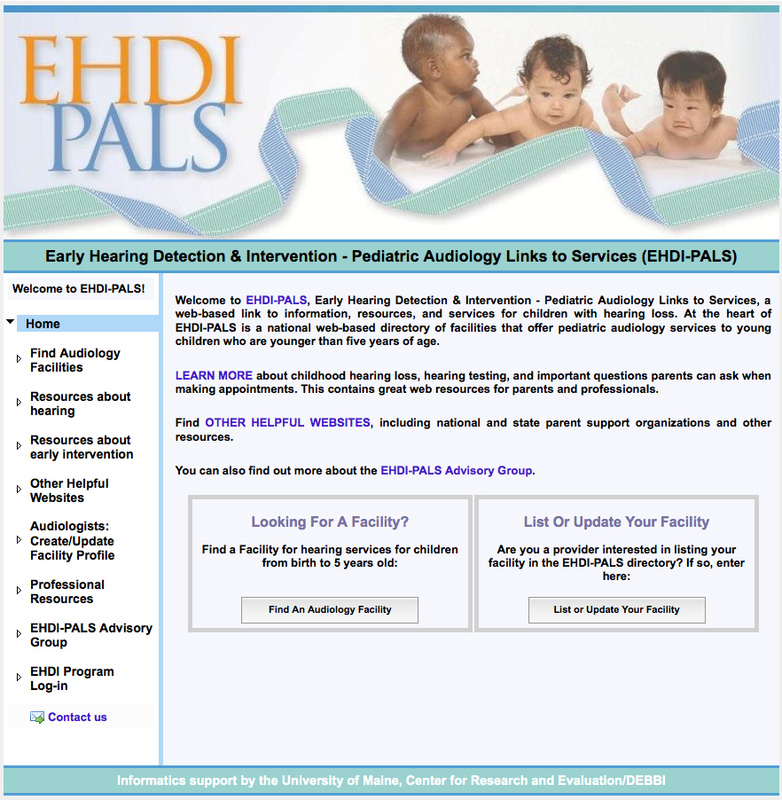 The EHDI-Pediatric Audiology Links to Services (PALS) is a web-based directory and search engine designed to help parents, hospital personnel, and referring physicians find the nearest clinic that can provide the type of hearing service each child needs. 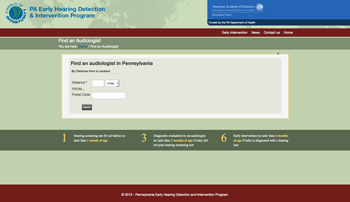 PA EHDI website allows its users to access Finding an Audiologist information with a distance from a zip code.